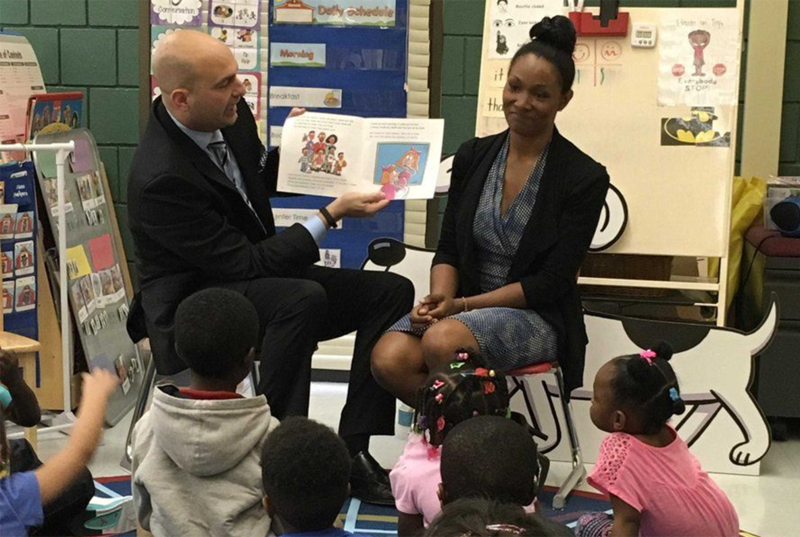 Duval County Public Schools superintendent Nikolai Vitti, who was selected this week to lead Detroit's main school district, reads this week to students at Woodlawn Acres in Florida with his wife, Rachel Vitti. (photo via Twitter). Nikolai Vitti, the Florida school leader selected this week to run Detroit schools faces many steep challenges. Among the most daunting: He’ll be working with people who wanted someone else to get the job. “Educators wanted Alycia Meriweather,” said Andrea Jackson, a college advisor at Osborn Collegiate Academy of Mathematics, Science and Technology, an eastside high school. Meriweather has led the district as interim superintendent for over a year and had been the top choice of many district administrators, community leaders, and city teachers. She was eliminated from consideration last month when the board decided it wanted someone with at least three years of superintendent experience. That decision sparked angry protests, but the board moved ahead with interviewing two finalists and Tuesday night voted to negotiate a contract with Vitti for the top job. “Dr. Vitti should work side by side with Meriweather as Assistant Superintendent,” the district’s teachers union said in a statement about the appointment that focused first on its disappointment that she had not been considered. And if Meriweather is not personally involved in the new administration, many Detroiters are urging the new superintendent to make her ideas and plans a part of his agenda. “I have heard repeatedly from teachers and principals, current and retired, over and over again, how [this year under Meriweather] is the first time in years that people have a sense of optimism and hope in a DPS superintendent,” said Sheila Cockrel, a former Detroit city councilwoman who leads a voter education organization and community action group called CitizenDetroit. Meriweather did not respond to a request for comment. But people who’ve followed her work say the new superintendent should be careful about coming in with his own agenda and tearing up work she’s done. The district has more than 200 vacant teaching positions — forcing schools across the city to cram far too many students in far too few classrooms. One way to recruit more teachers is to pay them more, said Ivy Bailey, head of the Detroit Federation of Teachers, which is currently negotiating a new contract with Meriweather that the new superintendent will have to execute. The average Detroit teacher made $57,793 last year, putting district salaries behind many suburban districts and charter schools. But attracting and retaining teachers goes beyond pay, Bailey said, especially after years in which state-appointed emergency managers imposed many changes in the district. Manningham, the principal at Denby, added that the new superintendent should find ways to pay bonuses to help bring teachers’ salaries up to the level of their suburban colleagues and should look for ways to help teachers improve their skills and advance in their careers. Jackson said even small gestures would help. Detroit schools have one of the highest rates of chronically absent students in the country. Meriweather told the school board earlier this year that a stunning 48 percent of the district’s students — more than 23,000 kids — missed two or more days of schools per month, making it difficult for educators to have much impact. Manningham said absent students are the biggest challenge she faces at Denby and called on the new superintendent to look into expanding school bus transportation. “We don’t provide yellow buses in high school and a lot of time [city buses] are running late or buses don’t show up,” she said. Manningham called on the new superintendent to use “courageous creativity” to manage schools. She said principals should be given flexibility to adapt their budgets and curricula to allow for innovations that would help their students. She suggested, for example, that Vitti create a more streamlined system of dual credit programs that let kids earn high school and college credits at the same time. Some dual credit programs exist now in the district, but they’re limited to certain schools and not part of a citywide connection with local colleges. At many city schools, budget cuts have squeezed out many of the “extras” that make school engaging for students. The new superintendent should “focus on reopening the swimming pools, marching band, arts, music, dance, and home economics programs to increase career opportunities for students,” Jackson said. These programs would “increase college scholarship opportunities for students and decreases fights, conflicts and negative behaviors among students,” she said. To help schools meet students’ needs, the American School Counselor Association recommends a ratio of one counselor per 250 students. Few if any Detroit schools achieve that level of staffing — meaning that students’ considerable needs are not always addressed. The legislative maneuver last summer that created a new district called the Detroit Public Schools Community District freed Detroit schools from debilitating historic debt, but low enrollment continues to harm the district financially. The new superintendent needs to have a “very clear strategy to ensure that the financial resources are in the classrooms for the purpose of educating children,” said Cockrel of CitizenDetroit. Attracting more families to the district will require a mix of all of the above, plus stronger programs that would give families a reason to trust that the district is improving. Vitti promised during his public interview to try multiple strategies to woo back families that have departed for charter and suburban schools. Detroit is still Detroit....It's the same people making the same mistakes that are running things. The mistake is thinking that more money will solve the problem. So how did the situation get out of hand even though more money was being put forward? Graft, corruption , theft, drugs, crime and unions might be looked at much more closely at every level in Detroit. More students don't come forward when the neighborhoods have deteriorated so badly and families move out. In order to attract more population back to Detroit, there has to be a true admission that crime and personal safety is the major consideration when considering moving back to Detroit. No Superintendent is going to be able to do anything about those vitally important subjects without major overhaul of Detroit and Lansing's governing political parties and elected officials. Doing the same things over and expecting different results is truly insane. What I didn't read, but should be there is parental involvement. Now a parent may not have the education to help a student with a specific subject, but that parent should be able to make sure the child is doing homework and not playing on the phone, getting up in the morning and off to school, getting to bed at night at a reasonable hour, and attending conferences. If the parent does not show an interest in the child's education, then neither will the child. I also thought it telling that the high school student in commenting on class size discussed how loud the classroom was and how the teacher had such a hard time maintaining control. I remember the "old days" when nuns regularly taught classes of 40 to 45 students, and you could hear a pin drop when they spoke. This is just common courtesy, something that needs to be taught at home. I have been saying that from the get-go. We did not have para pros in the class and there was no unruliness. The teacher spoke; the kids spoke when asked. That learned respect has to start in elementary school. Actually, it starts in the home, but regardless, it can be taught to young kids. There is too much leniency for bad behavior and rudeness. Too much PC. His biggest problem will be the teachers union and the people who are already telling him what he must do, Period. All good ideas but can the new superintendent gain the trust of teachers, other administrators, students and parents? And make reasonable progress on those seven goals? Only time will tell. And maybe if the teacher's union wasn't so stubborn more help could be brought in from the community in the form of teacher's aides. I am retired and have 25 years financial accounting experience and an MBA. I'd love to teach on a high school or middle school level---I even have a lesson plan---but I don't want to have to spend two years getting a teaching certificate. My experience and education should at least qualify me to be a teacher's aide. And I'm not looking for a huge amount of money or time. Part time and $15---$20,000 a year with no benefits would be fine with me. I am certain I could contribute something of value and help relieve the pressure caused by the serious lack of teachers. But the teacher's union apparently won't budge on loosening the requirements. I think that is a big, big mistake. And part of the problem. educate children not for the benifets of the adults . What I didn't read, but should be there is parental involvement. I suspect they didn't mention it is because it is basically a lost cause and they know it, so they try to do what they can otherwise.